This collection contains photographs taken by Kalleen Mortensen, a Madison, WI resident and long-time member of the Deer Park Buddhist community. It covers the years 1976-2016, a 40-year span that includes photos of the abbot and founder of Deer Park, Geshe Lhundup Sopa, His Holiness the Dalai Lama and his nine historic visits* to Madison, and community member activities, including the construction of several important structures and temples on the Deer Park property in Oregon, Wisconsin. 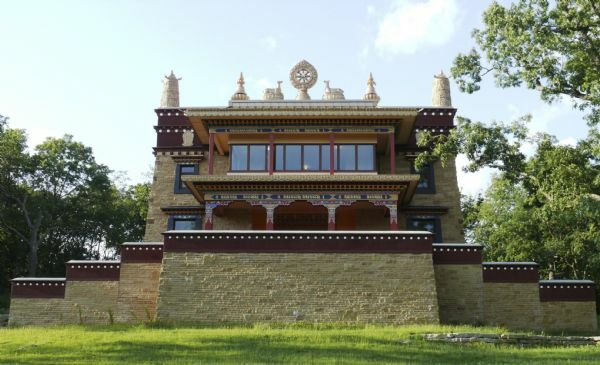 The Deer Park Buddhist community began in 1976, when a group of about 20-30 young people, many of whom had recently returned from studying and traveling in India, moved to Madison. They came due to the reputation of Geshe Lhundup Sopa, who was teaching at the University of Wisconsin-Madison, in the newly-created Buddhist Studies program. They had embraced Buddhism as a personal spiritual pursuit and wished to enhance their understanding of Buddhist practices through study, teaching and meditation. Geshe Sopa had come to the UW-Madison, at the invitation of Professor Richard Robinson in 1967, to teach Tibetan Language (and later philosophy). Geshe Sopa retired in 1997, and remained a professor emeritus until his passing in August, 2014. The first teachings offered to the local community were given in several rental houses on Lake Mendota Dr. and then in Geshe Sopa’s house on Lake Mendota Drive in Madison. 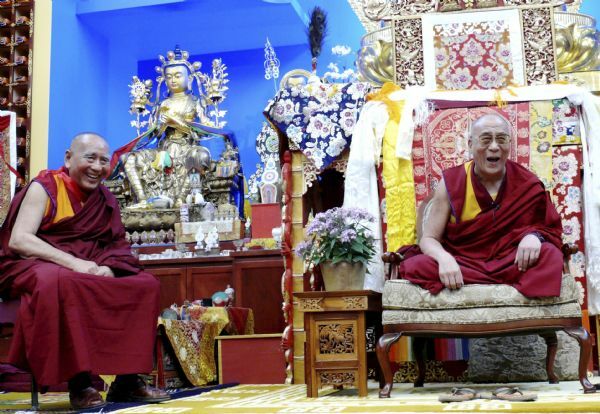 Following a request by Geshe Sopa to His Holiness, the Dalai Lama to confer the Kalachakra initiation in 1981, a permanent location was purchased at the present site in Oregon, Wisconsin. A temporary pavilion was erected for the ceremony which was later enclosed and winterized as a teaching venue. This continued as the main temple until the new temple was completed and consecrated in 2008. Between 1986-1989, a stupa (reliquary) was built near the original temple to commemorate the Kalachakra ceremony (the first one ever performed in the west). His Holiness, the Dalai Lama came to bless and dedicate the stupa in 1989. Throughout the years, teachings on many important, fundamental Tibetan Buddhist texts were offered by resident and invited teachers, including summer seminars and other activities. Deer Park also helped to bring many Tibetan refugees to Madison in the early 1990’s. In 2008, the North American Tibetan Associations and Deer Park representatives joined together to offer a Tenshug or Long Life Ceremony to His Holiness, the Dalai Lama in Madison, attended by over 3,500 people. Geshe L Sopa, the abbot and founder of the Deer Park Buddhist Center passed away in 2014 at the age of 91. Deer Park continues to this day as a vibrant monastic and lay community with a mission to offer the precious teachings of the Buddha in the Tibetan Gelugpa tradition.